In February, the Cycling Embassy of Denmark joined forces with local partners to organize a cycling games event at the World Bicycle Forum in Medellín, Colombia. The organisers wanted to be inspired by Danish experiences in developing a bicycle culture with a lasting effect on the development of cycling in Medellín and other cities around the world. So they invited Lotte Bech as a representative of the Cycling Embassy of Denmark. Together they created a cycling games event in the city focusing on bicycle training Danish style. The event was meant to create awareness and interest amongst conference participants as well as the citizens of Medellín. Apart from the main event, a workshop was organised about the method in order to firmly root and spread the cycling games practice in local kindergartens. Being inspired by the Danish Cyclists’ Federation’s successful concept ”cycling games” and the sports kindergarten Hylet in Copenhagen, the cycle team EnCicla from the planning office Area Metropolitana Valle de Abburá held a grand cycle event ”Ciclo Escuela”, with cycling games adapted to local conditions and mirroring Colombian culture. Assisted by local cycling organisations, employees from Medellín Municipality and teachers from the local kindergartens ”Biens Comienzo”, the cycling games were carried out over two days in one of the central open spaces of the city and were visited by 480 children aged 3-5 from 40 kindergartens. It was a real party for the children with music and cycling games on balancing bicycles, and there were “magical” people in costumes who helped the children and took care of them. For some of the children this was their first experience on a bike. The children had fun and that was the intention – bicycle training should be a game and it should be fun. Now EnCicla has plans to spread cycling games to the kindergartens of the region. Just like in Denmark, Medellín has sown the seed for a bicycle culture with children becoming cyclists for life. 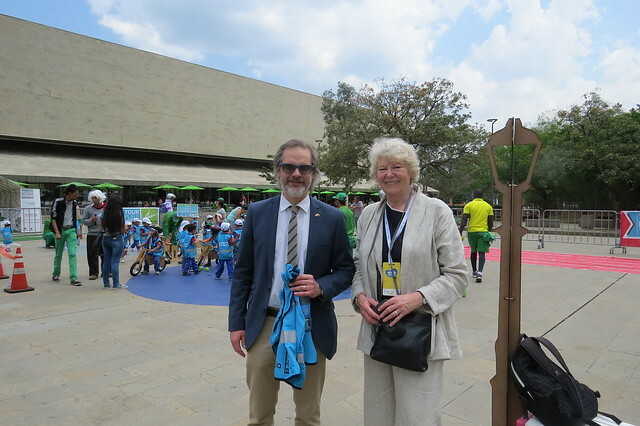 The Danish ambassador to Colombia attended the official opening of Ciclo Escuela and the embassy and Novo Nordisk Colombia supported the event with bicycle vests and other equipment. Novo Nordisk Colombia supports children and cycling as a part of their programme “Changing Diabetes”. Apart from the bicycle games event, the Cycling Embassy of Denmark contributed with a workshop ”Safety for Cyclists by Design” in cooperation with the organisation EMBARQ, presenting design ideas from EMBARQ’s urban design guidelines ”Cities Safer by Design” published in June 2015. Around 40 committed participants took part in a hands-on workshop developing suggestions for designs of bicycle lanes in a location which can actually be found in Medellín. The Cycling Embassy has had great experiences with this type of participatory workshop, amongst others “The Bikeable City Masterclass”. Finally, the Cycling Embassy of Denmark participated in a keynote panel discussion about Global Cycling Perspectives presenting Danish cycling activities with a global perspective. The 4th World Bicycle Forum (WBF) was held in Medellín, Colombia, 26th February to 1st March 2015, the overall theme being ”Cities for All”. The goal was to inspire the participants to create global networks that can drive urban changes around the world. The conference was arranged by NGOs together with a WBF Citizen Team consisting of 130 volunteers. Participation was free and so the organizers succeeded in creating a very broad audience consisting of both national and international participants. WBF 2015 became the largest international event for the promotion of urban cycling so far with 6,500 participants from 40 countries.